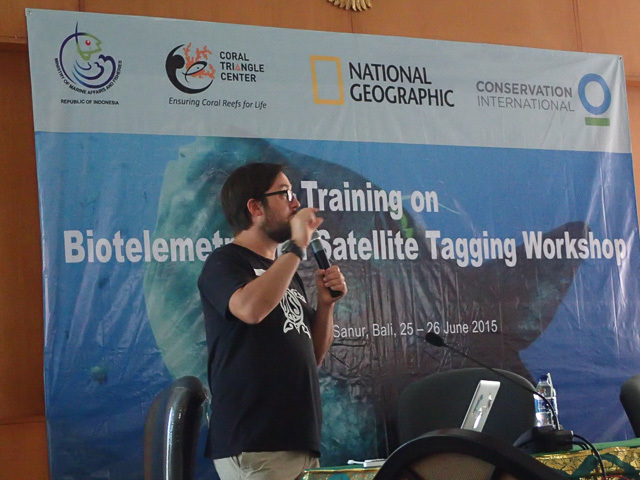 June 2015 found the mola team in beautiful Bali, Indonesia again working with the Coral Triangle Center (CTC) to run a Biotelemetry and Satellite Tagging training workshop. 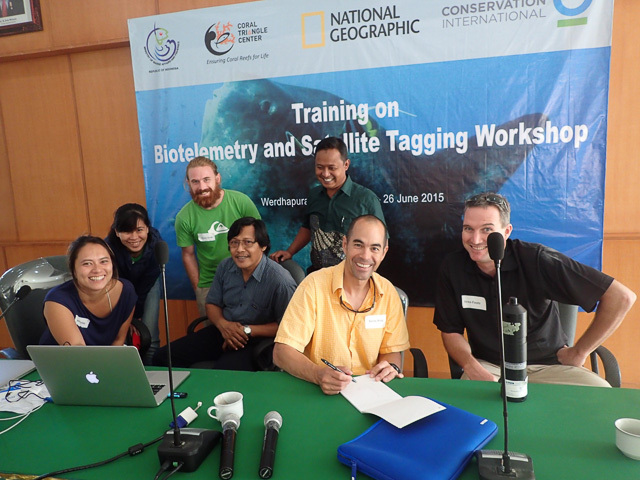 The workshop was funded by a National Geographic Conservation Trust grant with assistance from Conservation International and cosponsored by the Ministry of Marine Affairs and Fisheries, KKP, Balitbang and the CTC (Rili Djohani and Marthen Welly). 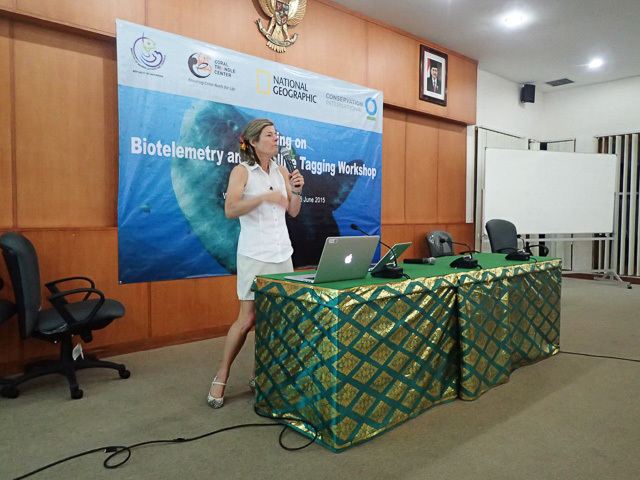 The workshop’s objective was to advance collaboration and efficacy of tracking and conserving marine megafauna in Bali and beyond. From the evaluations we’ve gotten in thus far, it appears it was a success! The workshop ran for two days June 25-26 and featured instruction by Dr. Alex Hearn and Dr. Kevin Weng in experimental design, ultrasonic telemetry, satellite tag use, data analysis and data processing. Brett Hobson from the Monterey Bay Aquarium Research Institute also gave a presentation on advanced AUV (autonomous underwater vehicle) operations. Vemco in Nova Scotia, Canada and Wildlife Computers in Redmond, WA provided tagging materials as demos. (Thanks Vemco and Wildlife!!) 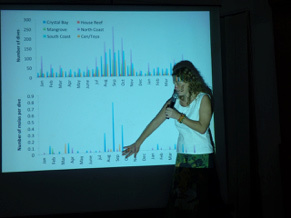 Dr. Tierney Thys and Marianne Nyegaard (Murdoch University) co-delivered four lectures on ocean sunfish over the course of one week. 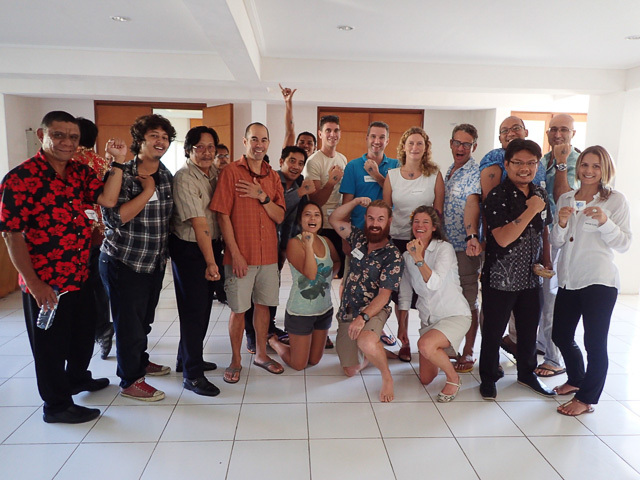 These included presentations to the Board of Directions of the CTC, MPA Management Unit on Nusa Penida and two public forums in Sanur after the workshop and on Nusa Lembongan. Miss Nyegaard and Erdi Lazuardi from the CTC also provided much appreciated assistance in helping to organize the meeting, and coordinate the invitation list. Following the workshop, a small team headed to Nusa Lembongan to conduct range testing demonstrations of the Vemco ultrasonic tags and to deploy moorings for the ultrasonic receiver stations with the help of the Bali Dive Academy (BDA) and in particular Sven Fautz. 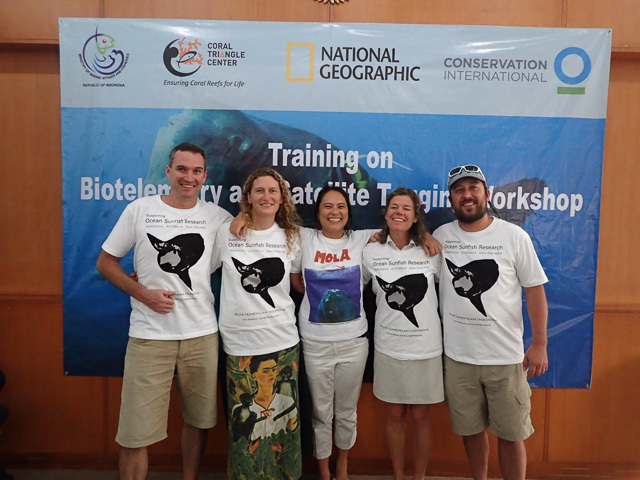 The Bali Dive Academy has been a long time supporter of our sunfish work in Indonesia and it was great to reconnect with Sven who helped us put out tags back in 2008. 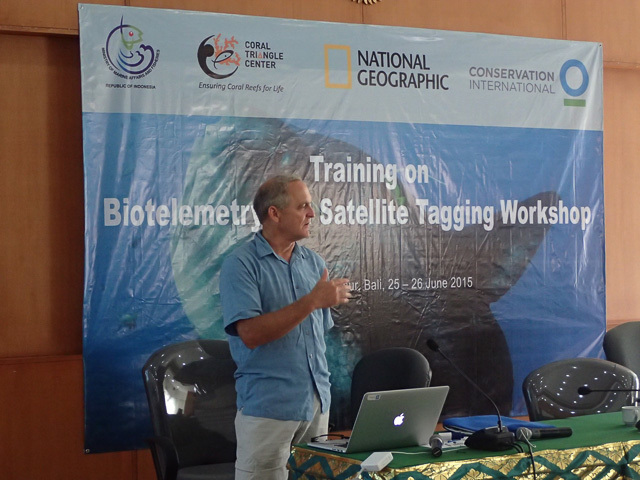 The CTC plan to tag sunfish with ultrasonic tags between August and September 2015, after which the Vemco receiver stations will be installed on their moorings around Nusa Lembongan and Nusa Penida with the help of the Bali Dive Academy and Marianne Nyegaard. We hope this initial array of ultrasonic receiver stations will grow and encourage more Indonesian scientists to track local marine megafauna around the islands of Bali. Such technology exchanges offer essential tools for bolstering our knowledge of these amazing animals so we can all better conserve their role in both the oceanic food web and as valuable ecotourism assets.